Crusher Bolts - UK Manufacturer - ©2019 Brooks Forgings Ltd.
We produce a wide range of hot forged bolts in high tensile steels for the machinery, crushing and screening industries. Sizes range from M16 up to M64 with varying head shapes, up to 1.5m in length. Where practical, we encourage our customers to negotiate a 12 month usage and deliver against call-off requirements. This would enable you to take advantage of a fixed price established at the start of a contract and so avoid paying increases as a result of continuing raw material upward movements. 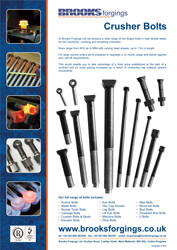 A brief overview of our Crusher Bolt product range.